There´s been a lot of death here lately, something hard to avoid when writing about the Great Mortality, so I thought I would liven it up a bit with something more entertaining; pirates. Or rather, privateers. Are pirates and privateers entertaining? Yes, I would say that what threatened to be an endless sequence of films about pirates roaming the Caribbean’s tell us they are, so here goes. But this will be about a specific type of “pirates”, the privateers, and even a more specific group of privateers: those of Elizabeth I, her Sea Dogs. Maybe first a short explanation of the difference between pirates and privateers (to the victims of either, I think it´s safe to say that the difference was of little consequence): while pirates raided ships to enlarge their own purse, the privateers did so with the expressed permission of their sovereign – even though they of course kept a portion of the loot – and a favourite target of the English privateers were the Spanish merchant ships. 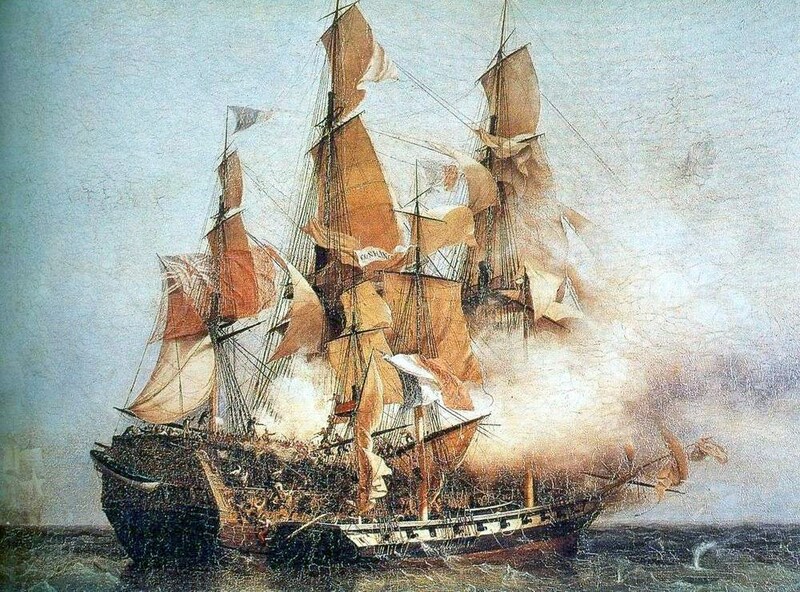 To be able to raid ships with the consent of the king or queen the privateer needed a Letter of Marque and Reprisal, which granted them the right to attack enemy ships without fear of punishment, at least by their own sovereign. The first letter was issued in 1243 by Henry III. The undoubtedly most reputable privateer of Elizabeth I was Sir Francis Drake, knighted on this day in 1581 on board his vessel the Golden Hind (a fact which highly inspired this post), and the reason for this was in no little part the wealth he had brought her through his activities. 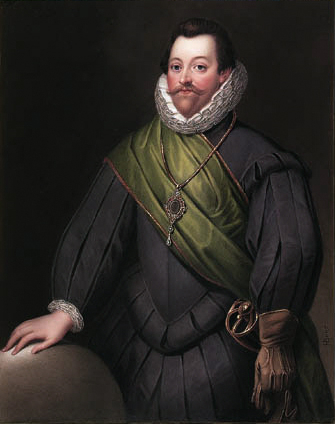 Francis Drake was born in Devon in 1540 and made his first journey to the Americas at the age of 23 in the company of his cousin John Hawkins who would also become one of Elizabeth´s Sea Dogs. Even if Francis Drake must be said to have been the most prominent of the Sea Dogs, and certainly the one who´s name is most known today, he wasn´t the only one. Apart from him there was also Thomas Cavendish – known as The Navigator for his attempt to emulate Francis Drake – and Martin Frobisher, who would be knighted after his participation in defeating the Spanish Armada in 1588. It is sometimes suggested that Sir Walter Raleigh and his half-brother too were privateers, but this is not true. Raleigh was however a staunch supporter of the Sea Dogs, but never participated in the enterprise himself. Maybe his support abated some when Elizabeth at one point decided to invest in the privateering business instead of his own colony in Virginia. 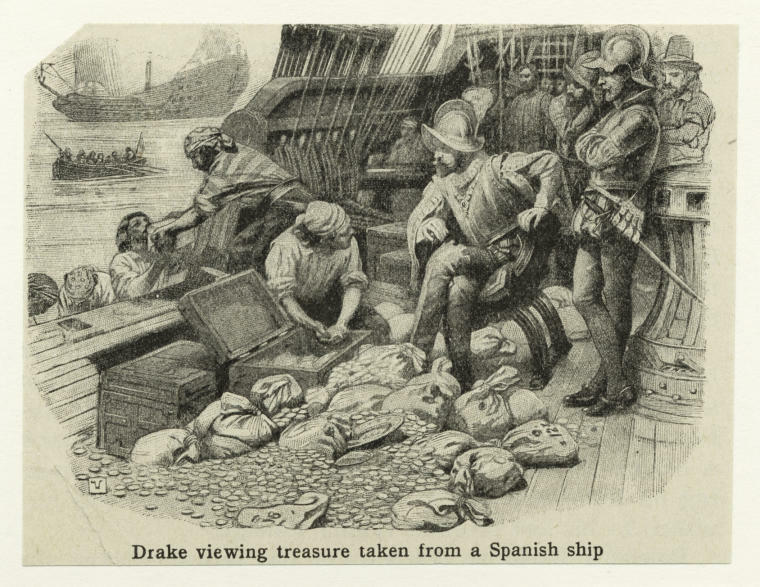 John Hawkins primarily attacked Spanish ships in the Caribbean, while Francis Drake raided Spanish ships as far away as what is now San Francisco on the Pacific coast. During one of his journeys to raid unguarded ships on the Pacific, he on his way home managed to complete the second circumnavigation of the globe. While one, and I believe we´re not few, can feel a modern day fascination for pirates, licensed or not, (a fascination no doubt fuelled by a long row of Hollywood productions, from Errol Flynn and onwards) there was also a less than savoury side to their enterprise in that that at least the privateers more often than not also was engaged in the slave trade. 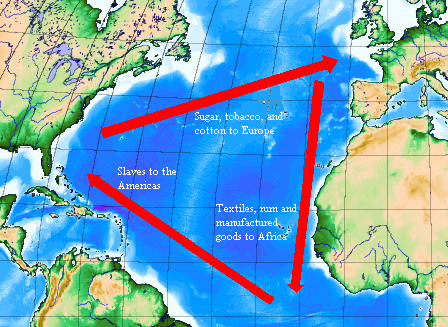 Fact is that John Howard, earlier mentioned cousin of Francis Drake, was the first privateer/slaver to complete which was known, or at least came to be known, as the triangular trade where one brought textiles, rum and manufactured goods to Africa where one bought the slaves who were then brought to – in these days – primarily to the West Indies where tobacco, sugar and cotton were picked up to be sold in England (by English privateers) which all meant that there was a profit to be done in all ends of the trade. The premise of the privateers during the reign of Elizabeth I was very much the constantly ongoing conflict with Spain. After the death of the queen in 1603, a truce was reached between the two countries in 1604, and raiding Spanish merchant ships was no longer commes il faut. Instead many Sea Dogs continued as pirates employed by the Barbary States, in what would become the Anglo-Turkish piracy. By then Sir Francis Drake was dead, having succumbed to dysentery during an unsuccessful attack on San Juan in Puerto Rico in 1598. Ps. 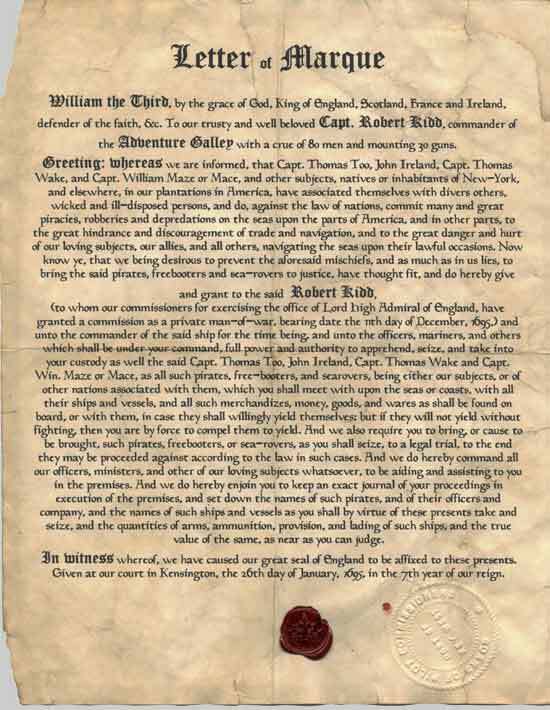 Crown protected piracy however continued for another couple of centuries, and the Letter of Marque further up in the post was issued by William III to Captain Kidd (another name immortalised through books and films) in the late 17th century.